The Fresno Juneteenth Collaborative Committee is excited to announce its Annual 2019 Juneteenth Celebration! This year’s theme is “UNITED WE STAND”. The one-day event will serve to recognize the importance of achieving your goals and desires. Dare to dream bigger than you can imagine, and then work to achieve it. As you may know, Juneteenth is the African American’s addendum to Independence Day. It is a nationally recognized and celebrated holiday which commemorates the notification of the Emancipation Proclamation to Galveston, Texas on June 19, 1865 in which the Fresno community has been celebrating this historical moment for over 30 years. 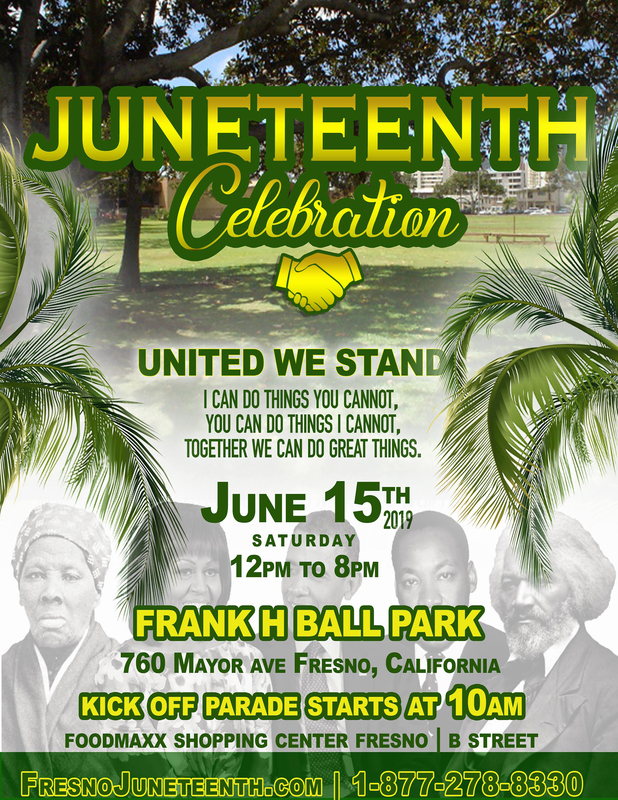 On Saturday, June 15, 2019, the Fresno Juneteenth Collaborative Committee will host the Annual Juneteenth Celebration at Frank H Ball Park located at 760 Mayor Ave, Fresno, CA 93706, from 12pm to 8pm. Juneteenth will be a celebration of African-American culture, heritage and pride. This years’ one day observance is expected to attract over 10,000 community members, adults, and children who will enjoy the weekend festivities which include a parade, local performances, inspirational speakers, workshops. In addition, there will be a variety of food that represents the African American culture, games and entertainment to satisfy all age groups. Thank you in advance for your support and partnership.